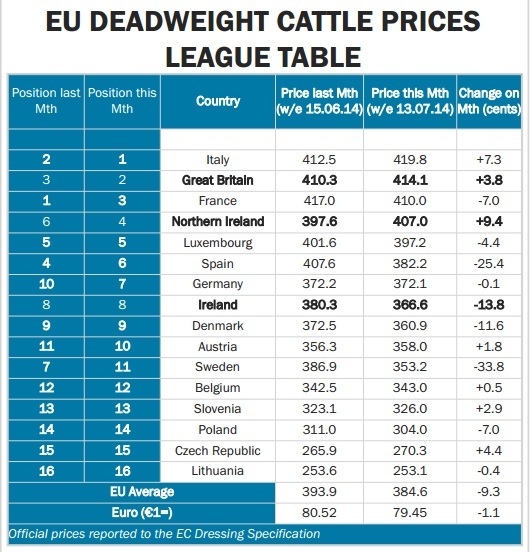 According to the European Commission’s latest figures Ireland is unchanged in eight position on the EU deadweight cattle price league table although the Irish price has reduced by €0.13/kg to 336c/kg. Italy topped the table with prices in the country up 7c on last months figures. Britain moved up one position to second in the table with prices also up marginally on last months figures. Northern Ireland also saw its position rise, up two places to 4th this month. According to latest reports from the ICSA steer prices remain unchanged last week at €3.70/kg – €3.75/kg base. Heifers were up slightly at €3.75/kg – €3.80/kg. Quality bulls are making €3.60 – €3.80/kg and cows were between €3.30 – €3.50/kg. Latest weekly beef kill figures from the Department of Agriculture, Food and the Marine show that at 28,152 the week ending June 20 saw throughput at meat plants was the lowest since late August 2013, excluding the three-day ‘week’ at Christmas. The kill was among the lowest so far this year and was also marginally lower than the same week last year. Cumulative supplies since the beginning of the year are now running some 13% ahead of 2013 at 903,157. The steer kill was over 10,000 again for the third week in a row and is some 18% ahead of the same week last year. So far this year a total of 281,638 steers have been killed up 16% on 2013 at this stage. The heifer kill below 7,000 for the second week in a row. This is well below the 9,000 mark which has been reached on many occasions this year. In contrast to steers the heifer kill is below the same week last year which was over 7,000. The cow kill was 7,479 head more or less similar to the same week last year.